Ubuntu TV combines the benefits of many devices into one, for a simpler, more integrated entertainment experience. Terrestrial broadcast in US and EU standard formats, for standard or high definition content, with integrated electronic programme guides. Integrate your cable or satellite service into Ubuntu TV, to provide a unified customer experience. Ubuntu bridges the gap between television manufacturers and cable or satellite providers. Ubuntu TV integrates online content providers to offer a diverse catalogue of movies, TV shows and music straight from the Internet. Take advantage of Canonical's services framework and content partners, or integrate your own services. Second-screen experiences are an emerging trend in broadcast television. 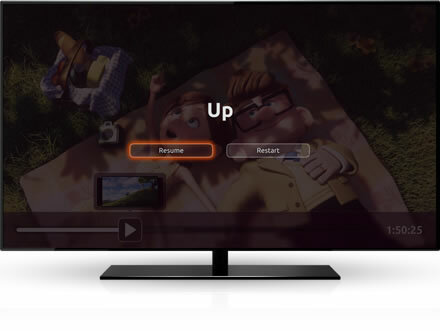 Link phones or tablets to Ubuntu TV, presenting related content to viewers while they watch. Provide information on movies by the same director, for example, or the reaction on Twitter during live shows — without any distraction from the action. The wealth of online content can leave viewers overwhelmed by choice. To simplify and streamline the experience we can prioritise what channels and shows have previously enjoyed, and even make suggestions on what else they might like. 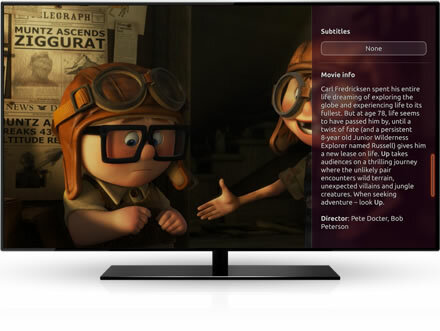 Ubuntu TV puts the world's content at your fingertips in a simple interface. Record TV shows with a separate playlist for each viewer — so Dad's needn't fill up with episodes of The Mickey Mouse Club. And because the TV can learn what Dad likes over time, it can suggest programmes he might want to watch that day, or movies to record in the week ahead. Viewers enjoy content on multiple devices — phones, tablets, and the TV. With Ubuntu TV, they can pick up where they left off on a different device. For example, a viewer can watch part of a movie on their phone, then watch the rest on the TV — without having to search for their place. Ubuntu TV runs applications from you or from third party developers. Deliver apps through an online store, update them when necessary and benefit from the growing ecosystem of Ubuntu application developers.